Here are the top and best resume writing tips for freshers / job seekers. – Use good quality paper for your resume and use simple font instead of using some fancy stylish fonts. – Use bullet points, So that it will be easy to read. Avoid using long paragraphs. – Always remember to put your mobile number and e-mail id, if possible give an alternate number. – Put the most important information first on your resume. 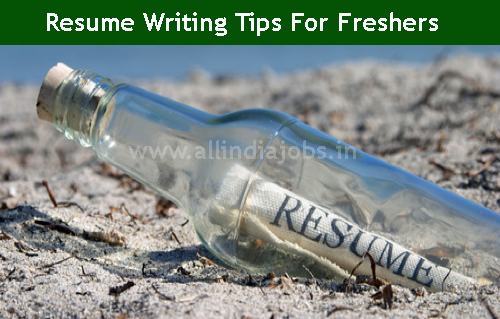 – Try to restrict your resume to not more than two pages. – Check for spelling errors and grammatical mistake before you take a final copy of your resume as even a small error could cause rejection in interview. – No lies, please. Even small lies should be avoided. – If you are a fresher then stress more on your education section and also mention other additional qualifications in detail. – Give a brief description about projects and extra-curricular activities undertaken by you. – Having a photograph on your resume is a good idea. There is no rule that a resume should or should not have a photo. – Don’t include too much information. – It is a good idea to update your resume on a regular basis. Add all the new information that you think is relevant, as well as courses, training programs and other academic qualifications that you might receive along the way. – Last but not the least: Even if you think you resume is looking excellent, it would be a good idea to get a second person opinion about it. can you provide some sample resume for fresher…???? Yeah for cover letter it would be fine to use pronouns.